Take our quiz to find out if you exhibit “white fragility” traits. How Does Race Shape the Lives of White People? This reading guide is intended to support formal and informal group discussions of White Fragility. We offer the following pedagogical tips as you organize your discussion. Small group discussions work best when the size of the group is large enough to advance discussion but not so large that any member of the group can avoid sharing--or conversely, wants to share, but cannot find airtime to do so. For this reason, it is recommended that groups target a size of five to seven members. If you are part of a larger study group, just organize yourselves into smaller sub groups of approximately five people. There can be strategic advantages to organizing yourself into what are sometimes called affinity groups, wherein people with a shared identity (such as cis-men, or Asian women, or Indigenous people) work through issues particular to them, in a closed group. If your group is diverse, discuss how you want to organize yourselves (in a mixed group or an affinity group for all or part of various chapter discussions). If you are self-monitoring your group, discuss how you will assign a facilitator for each session. This can be a rotating responsibility if you plan to meet over multiple sessions. The task of the facilitator will include keeping the discussion on topic, ensuring shared airtime, and note-taking (if part of a formal discussion group), as well as ensuring that the group’s time is monitored. Based on the following patterns, it is highly recommended that a facilitator or team of facilitators be assigned when primarily white groups discuss racism. Facilitators should think of themselves as guides rather than as teachers. This means the overall task of the facilitator is to keep the group focused and on track, with equitable sharing of the airtime. This will be easier to do if at the start of the discussion you tell the group that this is your task. You could even name the patterns ahead of time and ask group members to watch out for these themselves. 2. Checking out: Identifiable via behaviors including texting, working on laptop, engaging in side conversations. 3. Dominating the discussion: The same person or people speaking first, at length, immediately, and/or several times while others sit back in silence. 4. Positioning themselves as already getting this/Giving evidence for why this discussion doesn’t apply to them: “I already know all this.” “I come from . . . and I can’t believe how white it is here.” “I realized many years ago that . . .” “I am married to/have children who are . . . ,” followed by distancing (rather than insight and recognition that this doesn’t exempt them and their learning is not finished). Response techniques: “At what age were you aware that black people existed? Where did they live? If in Africa, what were your impressions of Africa? Where did you get your information about Africa?” “Did you watch Hollywood movies? If so, what impressions did you get about African Americans from US movies? What about Disney movies and cartoons?” “What was your relationship to Asian heritage people? What were Asian people like, in your mind?” and so on. 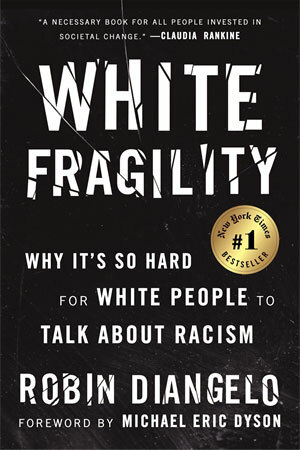 These sentence starters, termed “silence breakers,” are suggested openings intended to address two common challenges for white people in cross-racial discussions: First, the fear of losing face, making a mistake, or not being able to manage impressions that often prevent white people from authentic engagement. Second, the lack of humility we often have when discussing racism. The silence breakers can help engender a stance of curiosity and humility that counters the certitude many white people have regarding our racial perspectives. In doing so, they tend to open, rather than close, discussion and connection. I’m really nervous/scared/uncomfortable saying this and/but . . .
From my experience/perspective as [identity] . . .
I’m afraid I may offend someone, and please let know if I do, but . . .
I’m not sure if this will make any sense, and/but . . . It seems as though some people may have had a reaction to that. Can you help me understand why? This is what I understand you to be saying: ____ Is that accurate? I’m having a “yeah but.” Can you help me work through it? I’m engaged but just needing time to process this. What I am working on processing is _____. This book and its arguments build on antiracism scholarship and activism that people of color have written for generations. That scholarship has been fundamental to the ability of the author to explicate white fragility. Use this text as the starting point—rather than the ending point—to educate yourself on racism. There are many suggestions for engaging with the work of people of color in the Resources for Continuing Education section of the book. The primary goal for white people working to understand racism is not to learn how racism impacts people of color. The primary goal is to recognize how the system of racism shapes our lives, how we uphold that system, and how we might interrupt it. For people of color, multiracial, and Indigenous peoples who are part of an informal or formal discussion group, the book and this guide will hopefully validate your lived experiences and offer some helpful insight into the challenges of trying to talk to white people about racism. Like the book, this guide is primarily focused on raising the consciousness and increasing the cross-racial skills of white people. In so doing, many of the questions will be specific to them. Yet while the work of this text is primarily focused on the role that white people play within the system of racism, people of color are exposed to the same messages and must also consider how those messages have impacted them and the resultant role they may play. This dynamic is colloquially described as “assimilation” (or “acting white”) and is described in scholarship as “collusion.” These terms refer to people of color upholding values and behaviors that negatively impact their own and other groups of color and ultimately support white supremacy. There are many pressures to collude, the foremost of which is that there are rewards for conformity with the system. If we behave in ways that the dominant group finds favorable, we will likely receive benefits (or at least minimize penalties) in our daily interactions with them. As you study the dynamic of white fragility, consider your role and responsibilities in relation to collusion and adapt questions accordingly and as needed. The dynamics of white fragility are familiar in all societies in which white people hold institutional power and/or have a white settler colonial history, including Canada, Australia, New Zealand, Europe, and South Africa. While the book focuses on the specific sociopolitical context of the US, it is for you to reflect on how these dynamics manifest in your specific sociopolitical context. For white people who did not grow up in the US but live in the US now, consider how US-based racial dynamics (and globally circulating US cultural stories and images) shape your current ideas about race, your life, and cross-racial relationships. The chapter questions are intended to deepen your reflection and understanding of the chapters and constructively inform your response to white fragility. A strong opinion is not the same as informed knowledge. We have a deep interest in denying the forms of oppression that benefit us. We may also have an interest in denying forms of oppression that harm us. For example, people of color can deny the existence of racism and even support its structures. This denial may keep them from feeling overwhelmed by the daily slights or protect them from the penalties of confronting white people on racism. However, regardless of the reason, this denial still benefits whites at the group level, not people of color. Racism goes beyond individual intentions to collective group patterns. We don’t have to be aware of racism in order for it to exist. Our racial position (whether we identify as white, a person of color, or multiracial) will greatly affect our ability to see racism. For example, if we swim against the “current” of racial privilege, it’s often easier to recognize, while it’s harder to recognize if we swim with the current. Putting our effort into protecting rather than expanding our current worldview prevents our intellectual and emotional growth. Before you begin discussing chapter by chapter, spend some time reviewing the guidelines above. Identify a passage from chapter 1 that invokes any sense of discomfort. Highlight this passage and return to reading it periodically as you work through the book. What does this passage reveal about your socialization into the white racial frame? Does your discomfort shift over time? If so, what supported that shift? If you are working through these questions as part of a white discussion group, how will you keep the discussion on track (focused on ourselves and our own participation)? How will you ensure that when common white patterns surface (distancing, intellectualizing, rationalizing), you will work to identify and challenge them rather than ignore or avoid them? How do so many white people feel so confident in their opinions on racism, even as they live their lives in segregation? How can we make generalizations about what it means to be white when we don’t know each person’s individual story? What are some constructive ways to use your emotional reactions when your opinions on racism are challenged? Explain in your own words the author’s critique of the ideology of individualism. What does it mean to say that race is “socially constructed”? What is the difference between racial prejudice, racial discrimination, and racism? What does the author mean when she says that there is no such thing as reverse racism? How does the birdcage metaphor illustrate oppression? What is scientific racism? Give some examples of how scientific racism is conveyed today. What does Cheryl Harris mean when describing whiteness as a form of property? What is problematic about the idea of the US as a great “melting pot”? How did the melting pot actually work? Discuss Coates’s statement that race is the child of racism, not the father. The author cites Ruth Frankenberg’s description of whiteness as “a location of structural advantage, a standpoint from which white people look at ourselves, at others, and at society, and a set of cultural practices that are not named or acknowledged.” Explain each of these dimensions in your own words. How is the author using the term “white supremacy”? Explain the concept of the white racial frame. What are some examples? What patterns in the answers to the reflection questions do you notice within the group? What insights do the answers give you on implicit aspects of our racial socialization? What are some ways in which racism is “deeply embedded in the fabric” of society? Provide some examples. What is the impact of white people not knowing our racial history? What is color-blind racism and why is it problematic? How did racism change and adapt after the civil rights era? Consider attitudes as well as behaviors. Why does the author say that white progressives cause the most daily harm to people of color? Why does the author consider young white people today to be no less racist than white people in the past? Chapter 4: How Does Race Shape the Lives of White People? The author traces some of the specific ways that her life has been shaped by racism. Consider your own socialization. In what specific ways has your life been shaped by racism? (If you are white, try to answer this question without mentioning people of color). Identify at least three ways that white racial belonging has been conveyed to you in the last week (you might start by opening your wallet and looking at the bills there). What are the earliest racial messages you can recall? Try to move beyond what you were openly told and work to identify implicit messages. In what settings have you experienced the expectation of white solidarity/racial silence? How has that expectation been communicated to you? How have you responded? What consequences have you faced or fear you will face by breaking with white solidarity? The author describes the power of segregation. She argues that this segregation is “active.” What does this mean? Discuss how various patterns of segregation across your lifespan shape your racial frame. If you are white, which of the patterns discussed in this chapter have you seen in yourself? Which of the patterns challenge you the most? Why? Consider some aspects of your identity other than race (i.e., gender, sexuality, religion, class, ability, nationality, age). How does race shape how you experience these identities? For example, how might being white shape how you experience disability? Poverty? Gender identity and expression? If you are a person of color, how have you witnessed white people enacting white solidarity? The author states that white ignorance is not simply a matter of not knowing; it is a highly effective response that protects white investments in racism and thus is actively maintained. Discuss this statement. What does the author mean when she says that white people are not, in fact, racially innocent? How can we know much about race if we have lived separately? What does it mean to say that racism is “a structure, not an event”? The author suggests that one of the most effective barriers to talking about racism with white people is the good/bad binary. How have you seen this binary underlying common white responses to charges of racism? How might you respond when the binary surfaces in discussions about racism? If you are white, share some examples of the good/bad binary in your own responses to suggestions that you are complicit with racism. When the author challenges the idea that we are all unique and therefore cannot be generalized about, what thoughts and feelings come up for you? How might these thoughts and feelings function? The author lists two types of narratives that are commonly used by white people to deny complicity with racism: color-blind and color-celebrate (p. 77). Which narratives have you used yourself, or still use? If you could speak back to yourself with the voice of the author, how would you counter the narrative? How can a white person still enact racism in a close relationship with a person of color? Doesn’t the close relationship itself prove that the person is not racist? Explain how and why enacting racism in a close relationship with a person of color is not only possible but inevitable. If you are white, when was the last time someone challenged you to look at an aspect of yourself related to racism? How did you feel? How did you respond? What insights did/can you gain from the exchange? If no one has ever challenged you (or not in a very long time), what might that tell you about how whiteness shapes your life? The author claims that in the white mind, black people are the ultimate racial other. What does this mean? What does it mean to say that anti-blackness is present across all communities of color, even within black communities? How does the author make the case that the construction of white identity and white superiority was in fact dependent upon the simultaneous creation of a particular idea of blackness? How are these ideas sustained? What are some of the misunderstandings about affirmative action and what do these misunderstandings reveal about anti-blackness? Why haven’t affirmative action programs changed our racial outcomes? What does the author mean when she suggests that causing pain and suffering for black people rests on a sense of white righteousness? Return to the reflection questions on the white racial frame on pp. 34-36 and answer them while replacing the term “people of color” with the term “black people.” What do you notice? The author states that the film The Blind Side is “insidiously anti-black.” Using the framework of the book, explain how a viewer can not notice the anti-black messages yet still be shaped by them. Consider the bulleted list following the author’s analysis of The Blind Side. In which other films have you seen these racial scripts? Discuss the social taboos mentioned on p. 100. Give examples of each from your own life. Explain the triggers listed in this chapter in your own words and share examples of each in daily life. The author writes that white people have limited information about what racism is and how it works, while at the same time they have very strong opinions about racism. Explain how both of these can be true at the same time. In your own words, practice stating the difference between having information about what racism is and having opinions about what racism is. The author shares the story of Mr. Roberts and lists the ways that the two teachers in the story dismissed what they did not understand. Discuss this example. How have you seen or participated in these forms of dismissal? How does the author challenge the idea that our intentions are “what count”? Discuss Bourdieu’s concept of habitus as a way to understand the racial disequilibrium that leads to white fragility. In what ways is this concept helpful in explaining how racial disequilibrium works? What is the “discourse of self-defense”? Have you ever used it yourself? If so, thinking about it now, how did it function in the interaction? Share a time that you experienced your own white fragility or witnessed another white person’s. What strategies do white people use to reset white racial equilibrium? As a white colleague, how would you explain to Karen (p. 107) what is problematic about her response? If you are a person of color, what strategies could you use to address Karen’s white fragility? Why are questions such as “What is the right thing to say?” or “What am I supposed to say?” the wrong questions? How might you respond the next time you hear these questions? The author claims that white fragility functions as a form of bullying. How so? What is meant by the statement that white fragility is “white racial control.” How does white fragility function as racial control? The author ends this chapter by sharing an interaction with a man of color who, when asked what it would be like for white people to be open to feedback, replied, “It would be revolutionary.” She asks white readers to consider the profundity of this man’s reply. What feelings did you have when you read that response? How might this man’s reply inform how you respond to feedback from people of color, going forward? Why are white people more receptive to other white people (rather than people of color) educating them on race? What does this say about the role white people must play in addressing systemic racism in society broadly and specifically in our homes, with our friends and family members, and in our workplaces with our colleagues? What are the opportunities and dilemmas of white people educating each other on racism? Discuss the claims on pp. 119-120. Have you ever made any of these claims yourself? Now consider the assumptions underlying those claims on p. 121. Which ones have you held? Do you still hold some of these? If so, how do they function for you and what would it mean to you to shift them (what do you see yourself as having to “give up”)? In your group, take turns speaking back to the assumptions your group members shared in question 4. Which speak backs were the most effective for you? What is the language of self-defense and why is it problematic? The author presents a set of eleven “cardinal rules” (pp. 123-24) when giving feedback to white people regarding racist assumptions and patterns. For each rule of engagement, provide an example of the rule in action. DiAngelo presents these rules in a language of critique in order to reveal how they function. Of course the “rules” are rarely explicitly expressed this way. Consider what you hear white people say that communicates “do not give me feedback under any circumstances” etc.? Go through each of the eleven rules and share how you have heard these rules expressed in practice. In your own words, what is problematic about common guidelines for building trust in discussions about racism (e.g., “don’t judge”)? How do these guidelines function? Who are they for? Whose comfort do they protect? The rules of engagement around white fragility have at least three parts: those giving feedback, those receiving feedback, and those witnessing these exchanges. Practice some language for each by preparing your own “sentence starters” such as the silence breakers above. How might you begin to give feedback? How might you respond to feedback given to you? What might you say as you witness an exchange of feedback? The author opens this chapter with the story of a woman of color in a multiracial group stating that she did not want to be subjected to white women’s tears. Why were white women asked not to cry in the group? The author argues that emotions are political. How are emotions political?